Building model train scenery is one of the most enjoyable and rewarding aspects of model railroading. You can really show your creativity and artistic talent here even if you didn’t have any to begin with (speaking for myself of course). Using the tips and techniques described in this section, you can build a fantastic environment for your trains. It’s not that hard to do either. There are many materials available commercially now that make the job easy. Even so, you don’t have to buy a lot of stuff if you don’t want to. Many model scenery projects can be completed with materials that you already have laying around the house or that you can find in your backyard. Your model railroad scenery should reflect the general locale that you have decided to model, which in turn should fit realistically with your theme. For example, your logging train should be operating in a rugged mountainous area with lots of trees and with a sawmill or lumberyard nearby, not in a city or a flat field. In other words, everything on your layout should make sense, even if you made it all up. Try to keep perspective in mind as you build your model railroad scenery. You want your empire to appear larger than it is. Different levels of scenery help in this regard. Also using larger trees in the foreground and progressively smaller trees in the background or on the tops of mountains is also helpful. Some modelers will also put smaller buildings in the background than in the foreground to “force” the perspective. Also remember that the human eye usually only takes in one scene at a time. You may wish to have several separate scenes along the route of your tracks with each scene being an interesting or even humorous comment on humanity or lifestyles or elements of natural beauty, as long as they all fit in with your theme. Your tracks or roads will lead the eye along from one scene to another to keep up the interest of the viewer. Try to avoid having tracks or roads follow a straight line parallel to the edge of the layout. This tends to be somewhat boring. If you have to do this ( You may have to if you’re making a module to fit into a club layout), then try to add roads or streams that are going through the scene at an angle to break up the monotony of parallel lines. Terrain - How to form landscapes with mountains and valleys, riverbeds and gorges for your trains to run through or over. Tunnels - Tips on creating tunnels and making sure you have access to trains inside the tunnels in case there’s a crash. Rock Formations - Create realistic rock outcroppings, cliffs, walls of stone. Painting the terrain and rock formations - A very realistic method of painting and coloring your land forms is described. Ballast - How to choose the right ballast for your railroad and apply it realistically. Sunset Lighting - How to make special lighting effects so that when you turn the overhead lights down, your background sky lights up with reds and oranges to simulate a sunset. Roads - Paved, dirt or gravel roads add an important element to your model train scenery. Don’t forget these. Ground Goop - The first layer of ground cover used to cover the plaster cloth or other scenery base before applying turf and trees, etc. Ground cover - Developing grassy meadows, fields, underbrush, bushes, flowers, hedges, etc. Trees - Making believable trees and forests inexpensively. You can never have enough of these. Water - Detailed descriptions on how to make ponds, rivers, streams. Waterfalls - A dramatic addition to your layout. People will wonder how you did it. Bridges - Wood, stone or steel, straight or curved, big or little – your choice. Lift-Out Scenery – A way for you to have easy access to those hidden tracks where the derailments always occur. Details - Signs, Telephone poles, fences, people, animals – You need these details to make it real. Dioramas - a great reference website at http://www.stormthecastle.com/mainpages/dioramas/diorama_index.htm contains lots of fun diorama projects and tutorials, including how to make fantasy dioramas, trees, scenes, castles and more. 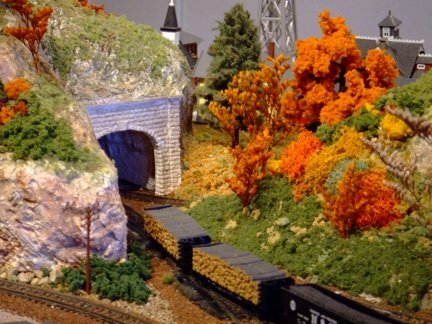 Other model railroad scenery tips – There are always new ideas coming out about how to make better model train scenery. Check out the Blog page every now and then to find new tips and techniques to enhance your model railroad layout. The model train scenery that you build for your layout will probably never really be totally finished, because you will always find something you’ll want to add or change or fix up and improve. You may decide later to change one whole section or wing of your layout. That’s okay. The fun of doing it and making it better is what it’s all about. And when you’ve completed a scene, the reward and sense of accomplishment that you experience is worth it all many times over. From "Model Train Scenery" to "Homepage"